Just as they did last year, an enormous flock of robins and a few cedar waxwings descended upon the neighbors' holly trees this morning and picked them bare within about 20 minutes. They then retreated into the trees to digest, and then flew away, leaving nothing but colorful dappled sidewalks behind them. I looked into the migratory patterns of robins and discovered that, while we tend to think of robins returning in the spring, this is only true of much more northern climes...like Canada. 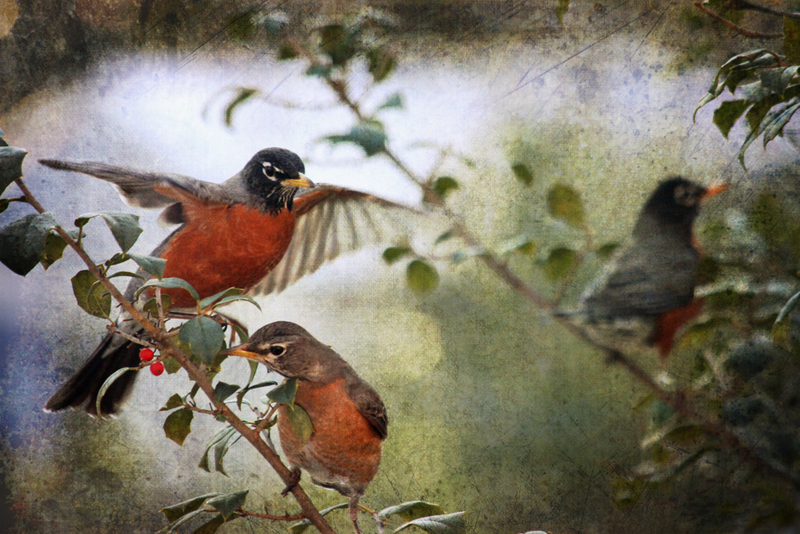 Here in the states, Robins are around throughout the year. We just don't see them as much in the wintertime because they flock together instead of being more evenly spread over an area. They also stay up in the trees more until the weather warms up. So the true harbinger of spring is not a huge flock of ravenous berry-eaters, but rather a lone robin or two, digging for worms. Hope to see that sight soon!